Keeping your building site tidy is key in ensuring that you get very good feedback from your clients and the building inspection authorities, plus it helps you work safely and more efficiently. Apart from these advantages, did you know that proper waste management at your building site also helps the environment tremendously? If you have not given much thought to what happens to your waste after you have disposed of them, read this article (as well as our very helpful infographic) so that you can adjust your waste sorting and recycling practices to be more environmentally-friendly. Proper waste disposal – which includes proper segregation – helps significantly in conserving space in existing landfills, as well as in reducing the need for future landfills. Proper segregation helps make it easier to determine if an item can still be recycled, or if it has no further use anymore. You don’t just help the environment, you also help other industries such as electronic, automobile, and packaging. Compacting general waste and recyclables makes way for less rubbish and recycling collections, so energy and fuel are saved. Additionally, proper waste management with the use of skip bins helps prevent illegal rubbish dumps that can do serious harm to the environment. Furthermore, proper waste management ensures that the release of harmful toxic chemicals into the environment is reduced significantly. Incorrect mixing of chemicals during the disposal process can lead to the creation of a flammable biohazard that does not just harm the environment, it also harms you. It is important, therefore, that you are aware of the toxic chemicals and what waste products have them, so that you and your workers will be very careful not to mix them with other components that can cause these toxins to be released into the air. 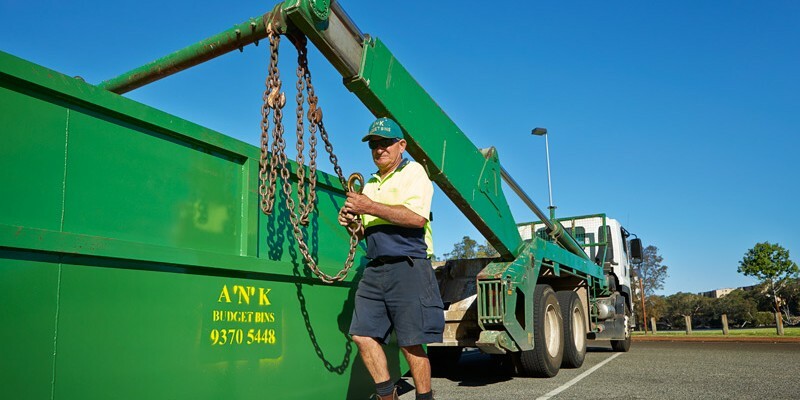 The use of skip bins on work sites can make this step infinitely easier and more convenient. When you recycle something, you consume less energy than when you manufacture the exact same item from new materials. This is because creating something new involves extraction and processing. Recycling is definitely more energy efficient, so your carbon footprint gets reduced, you save on resources, and you are reducing the amount of waste in the environment. The use of skip bins helps you keep your building site tidy, organised, and generally a very safe place to work in. They make storage very easy and lets you segregate your wastes in a very efficient and sanitary manner. A’n’K Budget Bins has a wide variety of skip bins for hire for you to choose from. Our skip bins come in different sizes, so you will surely find one that will suit your specific requirements. Furthermore, when you hire a skip bin from us, you are making a very ecologically friendly choice. All the waste from our bins are taken to a licensed waste sorting facility, so you know that, indirectly, you are still contributing positively to environment conservation.